The STIHL RT5097 C ride-on mower will effortlessly mow large lawns up to 6000m² in size. With its high degree of driving comfort and the clearly arranged controls, this ride-on mower offers well thought out features for effortless mowing. To achieve the most comfortable working position you can easily adjust the spring-loaded seat without the use of tools. 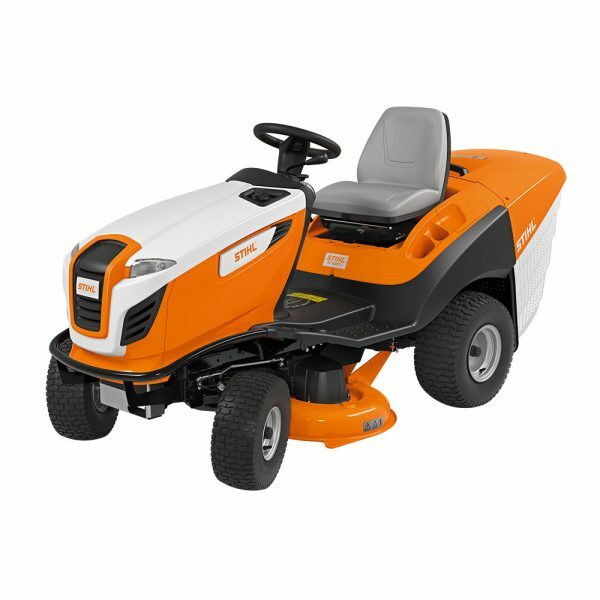 Thanks to the simple cutting height adjustment and the electromagnetic blade clutch for activating and deactivating the mowing deck, you achieve high mowing performance and a top-quality finish. The catching management system on both sides of the mowing deck gathers the grass across the entire cutting width and guides it towards the cutting blades. The comfortable single pedal drive allows you to manoeuvre the mower precisely, giving you full control, perfect for lawns with flower beds and shrubs. You can change the driving direction of the lawn tractor from forward to reverse gear with a single action. Thanks to the practical curve shaped handle, the 250-litre grass catcher box can be emptied effortlessly from the driver’s seat. And, the polymer grass catcher box is very easy to clean. The RT5097C comes with a 5 year extended warranty (subject to registration and annual servicing).